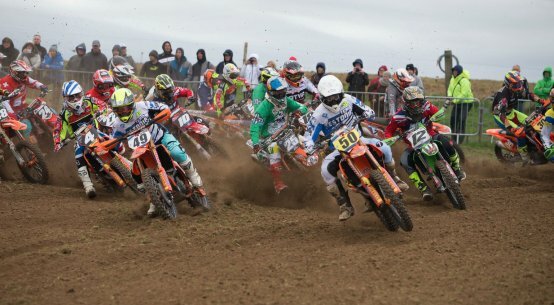 Although the dominance of super Brits Ray Rowson (KTM), Luke Burton (FUS Marsh MX Husqvarna) and Lewis King (LDR TMC Kawasaki) in the 2018 IMBA MX2 European Championship may have been temporarily halted on Sunday, the AMCA lads still look red hot favourites to seal eventual medal glory. 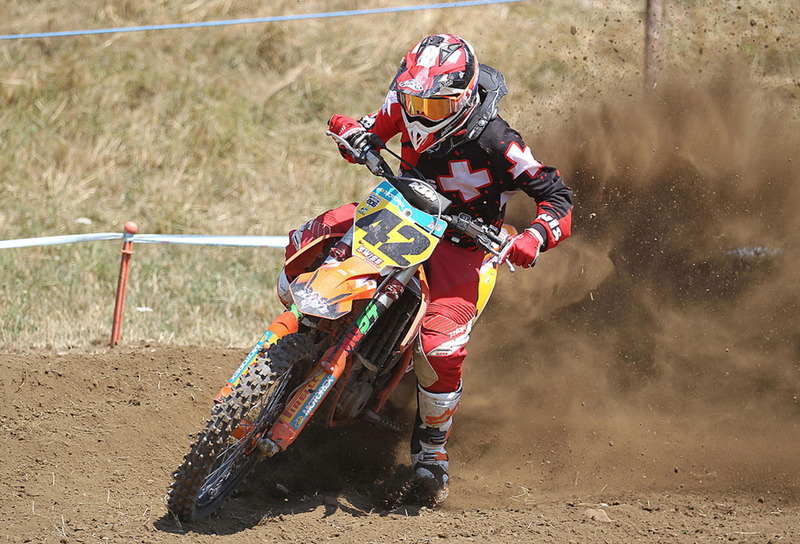 During round 4 at a red-hot Feldkirch in Austria, the Great Britain aces were to be beaten to the podium places by three extremely fast wild-card entries. Taking the win was Swiss ace Andy Baumgartner ahead of Lucca Bruggmann and Alex Andreis. 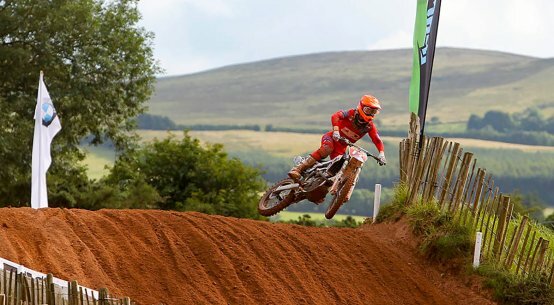 Top of the Brits was Rowson, taking a very determined 4th overall despite picking up a painful elbow injury whilst Burton was 6th and King 7th. 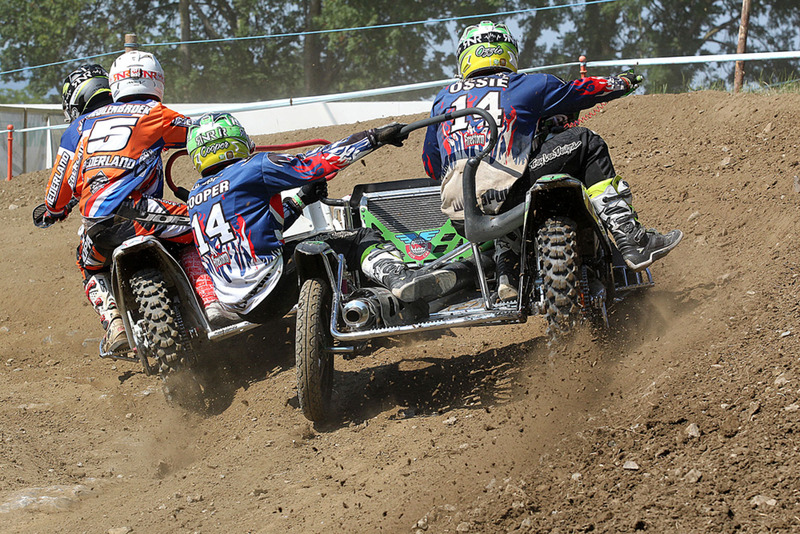 Also on the card in Austria was round 2 of the IMBA European Sidecar Championship with three crews representing the AMCA and producing some typically gutsy performances. Top of the Brits were Sam Osbaldiston/Nathan Cooper in a great 6th with Tony Grahame/Harley Lloyd 8th and West Country crew Ross Bowers/Rob Eastman 12th. So after our Brits and their supporters had endured a marathon journey across gridlocked European roads and were then forced off course after having been fed incorrect route directions, they finally arrived at a sunny Feldkirch, situated just over the Swiss border. And on arrival what a treat they received as the Austrian organising club along with co-operation from the SAM Swiss Federation produced a quality, professionally promoted event which was a lesson on just how an IMBA European Championship event really should be! Not only was the promotion top class but the racing was also of the highest calibre, starting with a thrilling opening IMBA MX2 clash. When the gate dropped for moto one it was Baumgartner, a rider who has represented Switzerland in the Motocross of Nations who grabbed the holeshot. As Baumgartner, cheered on by a massive crowd controlled from the front, the man on a serious charge was Liechenstein ace Luca Bruggmann moving from 7th up into 2nd by lap four. Also starting very well were Brits King and Rowson who gated 4th and 5th respectively and certainly right in the top end mix whilst Burton had plenty of work to do as he found himself down in 12th. 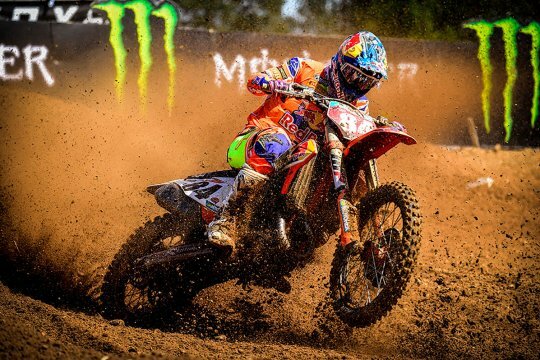 With a typically seriously determined ride, Burton eventually got back to earn 5th just behind Rowson who bravely dug deep to finish the moto after banging his left elbow very hard on a tracking marking post. As King kept the gas right on to finish 6th right behind his fellow Brits, there was to be a very thrilling conclusion to this race as Bruggmann brilliantly passed Baumgartner on the final lap for the win and thus silence a majority of the crowd! Despite being in immense pain, Rowson desperate to try and retain his IMBA series lead decided to compete in moto two and give it a go! Starting in 10th, Ray climbed up to 6th, dropped one spot to 7th before then finding more speed in the closing stages passing King and Burton along the way and thus earn a super 4th. Eventually, Burton and King got home in 5th and 7th respectively, adding yet more big Championship points hauls to their scores. In another classic battle for the race win, Baumgartner and Bruggmann swapped places before victory went to the very fast Swiss KTM ace. Once again, high quality home Austrian rider Alex Andreis took a strong 3rd. 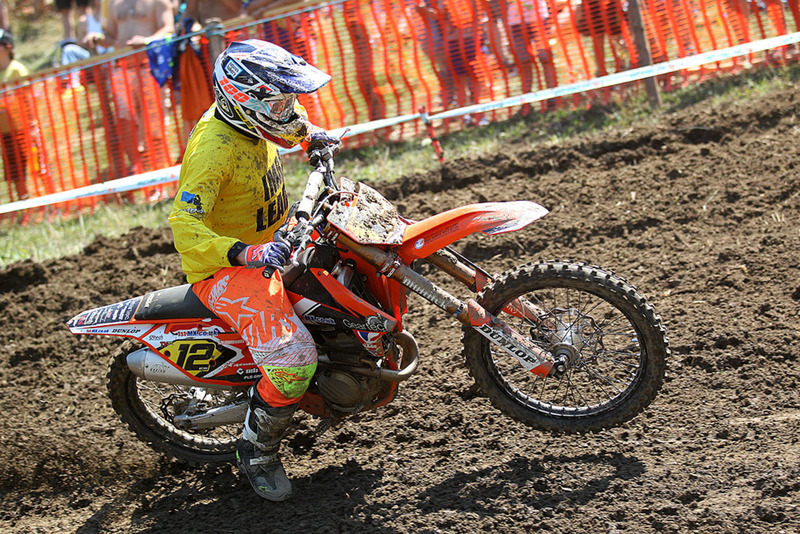 On a freshly watered track, Bruggmann ruined his chances of overall victory by slipping off in the early exchanges of IMBA MX2 moto three. Dropping down to 15th, Luca came back to 6th but it was not enough to stop Baumgartner with another moto success also taking the top podium step. Showing incredible determination, Rowson recorded his best finish of the day in this one to get home in 3rd whilst the very consistent and reliable King finished strongly moving from 13th up to 7th. Suffering a last a last race fall, Burton had to work hard in this one for 8th . Although the Brits didn’t record a podium in Austria, the most important statistic is the fact they still hold the top three IMBA MX2 Championship places. With just two rounds remaining in Italy and Germany, it’s still defending Champion Rowson leading the title chase on 488 points from Burton 461 and King 418. In the opening Sidecar contest at Feldkirch it was Austrian GP crew Benjamin Weiss/Patrick Schneider who took top honours with a classy win. Making overtaking look easy, Weiss after gating 6th then moved into top slot on lap three before going onto victory, 7 seconds clear of Swiss lads David Bolliger/Meinrad Schelbert. On what was a tight and very short start straight Sam Osbaldiston/Nathan Cooper rode a very clever first turn to initially hold 5th in the frantic, early exchanges. Young Ossie eventually finished a super 7th a very impressive moto one effort! Although Sam got off to a flyer in contrast Ross Bowers/Rob Eastman and Tony Grahame/Harley Lloyd were right at the back of the field and with it all to do! On an incredible charge, Grahame came storming back to bag a hard-earned 12th as Bowers also recovered in style for 18th. Such was the exhaustion of his efforts that Grahame was on the verge of collapse in the soaring heat, quickly requiring a big intake of water on completion of this red-hot moto! Following that heroic comeback, Grahame then made it a little easier on himself in the second clash of the day. Starting 11th he lost two places before getting right back on the gas to bag 5th at the flag. Sam Osbaldiston was to be the recovering hero this time though getting back to a composed 9th spot after being down in 27th on lap one. Having a slightly more straight forward outing compared with his fellow Brits, Bowers took 11th. 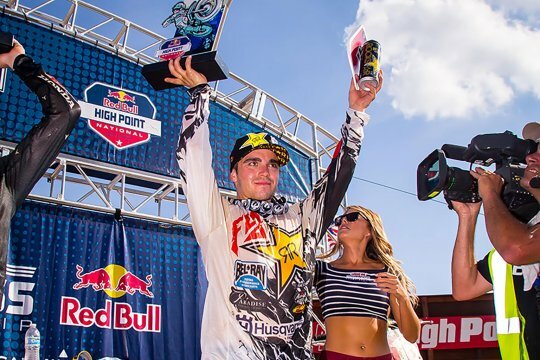 Taking the win again in moto two was the very classy Weiss. In the last sidecar moto, Dutch crew Mike Keuben/Lars De Laat were first past the chequered flag with Weiss only able to manage 4th. With another fast start, the smooth Osbaldiston produced a strong performance and finish his day at Feldkirch with a 8th place after initially gating in 5th. For Grahame the early exchanges were far from productive but with another momentous effort he somehow got back to 11th, just in-front of Bowers who produced a sterling ride to move from 22nd up to 12th. 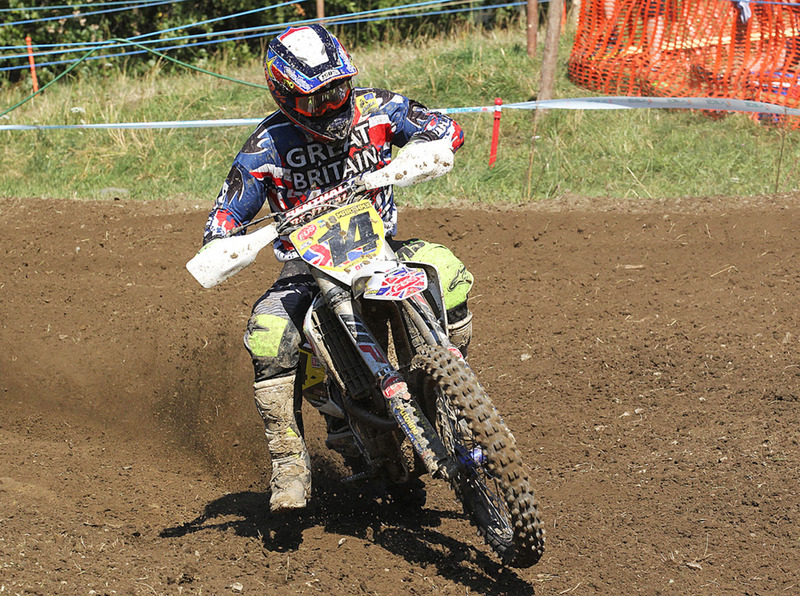 After two rounds of the IMBA Sidecar series completed, Osbaldiston holds 5th with Bowers 9th and Grahame 15th, their next event being the GB home round at Norley, Cheshire on July 15th. Moto one(top ten) 1 Lucas Bruggmann(Liechenstein) 2 Andy Baumgartner(Switzerland) 3 Alex Andreis(Austria) 4 Ray Rowson(GB) 5 Luke Burton(GB) 6 Lewis King(GB) 7 Ramon Meile(Switzerland) 8 Ronny Utzinger(Switzerland) 9 Glenn Bielen(Belgium) 10 Randy Morand(Switzerland). 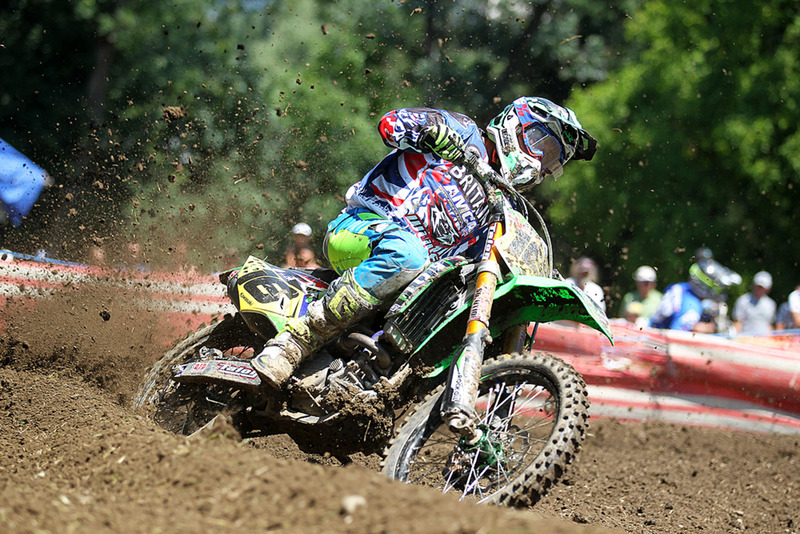 Moto two 1 Baumgartner 2 Bruggmann 3 Andreis 4 Rowson 5 Burton 6 Meile 7 King 8 Rene Ratz(Austria) 9 Bielen 10 Utzinger. Moto three 1 Baumgartner 2 Andreis 3 Rowson 4 Meile 5 Beilen 6 Bruggmann 7 King 8 Burton 9 Ratz 10 Tomas Nyvlt (Czech Republic). Overall 1 Baumgartner 174 points 2 Bruggmann 157 3 Andreis 154 4 Rowson 144 5 Meile 131 6 Burton 129 7 King 125 8 Bielen 119 9 Ratz 109 10 Morand 101. 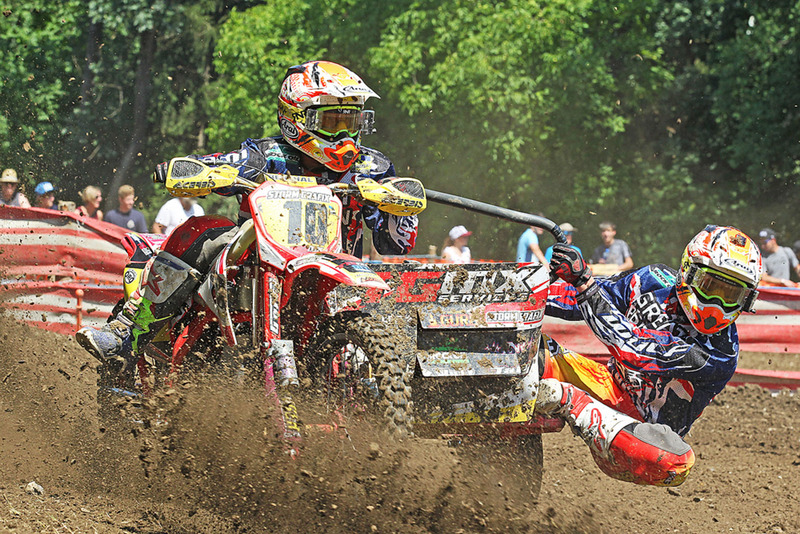 Moto one(top ten) 1 Benjamin Weiss/Patrick Schneider(Austria) 2 David Bolliger/Meinrad Schelbert(Switzerland) 3 Mike Keuben/Lars De Laat(Holland) 4 Frank Mulders/Henry van de Wiel(Holland) 5 Marco Boller/Marius Strauss(Switzerland) 6 Tim Prummer/Tobias Lange(Germany) 7 Sam Osbaldiston/Nathan Cooper(GB) 8 Christian Hentrich/Stefan Effertz(Germany) 9 Luc Descheemaeker/Dylan Delannoy(Belgium) 10 Martin Krieg/Bruno Kalin(Switzerland) 12th Tony Grahame/Harley Lloyd(GB) 18TH Ross Bowers/Rob Eastman(GB). Moto two 1 Weiss 2 Keuben 3 Mulders 4 Bolliger 5 Grahame 6 Prummer 7 Simon Nachbaur/Marco Hienzer(Austria) 8 Jeroen Tessuer/Ben Martens(Belgium) 9 Osbaldiston 10 Krieg 11 Bowers. 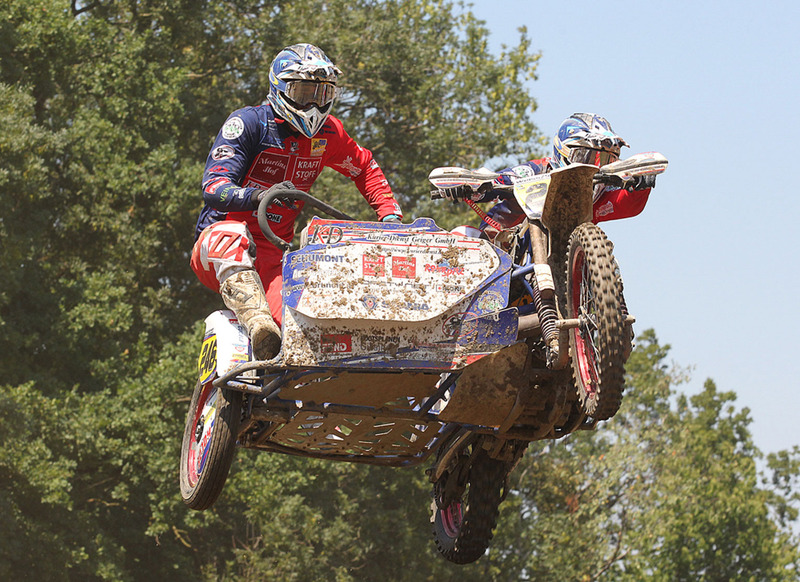 Moto three 1 Keuben 2 Boller 3 Mulders 4 Weiss 5 Bolliger 6 Prummer 7 Thom van de Lagemaat/Han van Hal(Holland) 8 Osbaldiston 9 Tesseur 10 Laurent Relandeau/Nicholas Guitteny(France) 11 Grahame 12 Bowers. Overall 1 Weiss 167 2 Keuben 164 3 Mulders 147 4 Bolliger 146 5 Prummer 129 6 Osbaldiston 117 7 Boller 114 8 Grahame 109 9 Tesseur 105 10 Krieg 95 12th Bowers 87. Words and pics by Mike Wood.